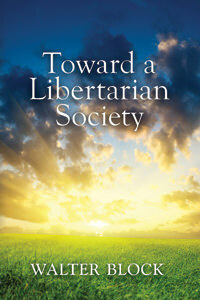 An account of libertarianism from a leader in libertarian thought. This is the digital eBook format. Walter Block has for decades been one of the most effective and indefatigable defenders of libertarianism. One feature in his writing stands out, from his classic Defending the Undefendable to the present. He consistently applies the principles of libertarianism to every situation in a bold and original way. Readers of Toward a Libertarian Society, a collection of his articles from lewrockwell.com, will find this feature abundantly on display. Block believes that libertarianism has three components: foreign policy, economic policy, and policies on personal liberties. He devotes a separate part of the book to each of these components. In foreign affairs, Block is a resolute non-interventionist. He is an anarchist who rejects the state altogether; but, so long as a state exists, it should confine its foreign policy to defense against invasion. Doing so is in line with the tradition of Washington and John Quincy Adams. In our own day, Ron Paul has been the foremost champion of non-intervention; and Paul has few, if any, more ardent advocates than Walter Block. In economic policy, Block defends the free market against all types of interference. One issue especially concerns him: the activities of labor unions. Against union advocates, Block emphasizes that wages depend on workers’ marginal productivity. Block is equally decisive in macroeconomics. He calls for the total abolition of the Fed. Block, never one to avoid controversy, argues that much in the contemporary feminist movement is antithetical to libertarianism. Readers will learn his views about abortion, stem-cell research, and punishment theory. He is a firm advocate of the possibility and desirability of political secession. Reading Toward a Libertarian Society is the equivalent of a college course in libertarianism, taught by a master teacher. 14. Private Enterprise and the Fed; What Should Be the Relationship? 34. Stem Cells: A Libertarian Compromise? 44. A Silving Lining in Unjust Executions? 46. Federalism: Is It Libertarian?